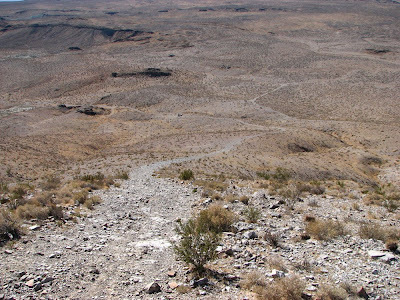 A few days ago I drove to Opal Mountain, north of Barstow, CA. I've driven through Black Canyon a few times, but I've never driven the Opal Mountain Road. 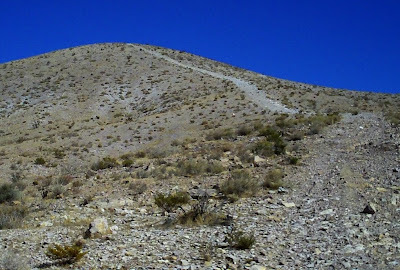 The Google Earth satellite imagery shows what appeared to be roads to the top of Opal Mountain, and I just had to see if I could drive up those. Here's a link to a Google Map centered on Opal Mountain so you can see those roads. The short answer on whether I could drive the road is ... no. I would pay money to watch somebody drive a stock vehicle up that road. The first 20 percent is steep but driveable. Then comes the challenge of parking or turning around on such a steep hill. The higher you go, the steeper it gets ... and the rocks get a little bigger and a lot looser. Near the top, I had trouble walking up the road, so I hiked the last part off the road where the ground is firmer (rocks don't slide out from under your feet). The photo looks down from the summit toward my car. It was very windy at the top, but calm and a nice 77F at the bottom. From here, I drove the rugged road out past Scouts Cove to the sandy wash and then returned through Black Canyon. The weather was great, and gas prices were as low as $2.33, so it was a good day.